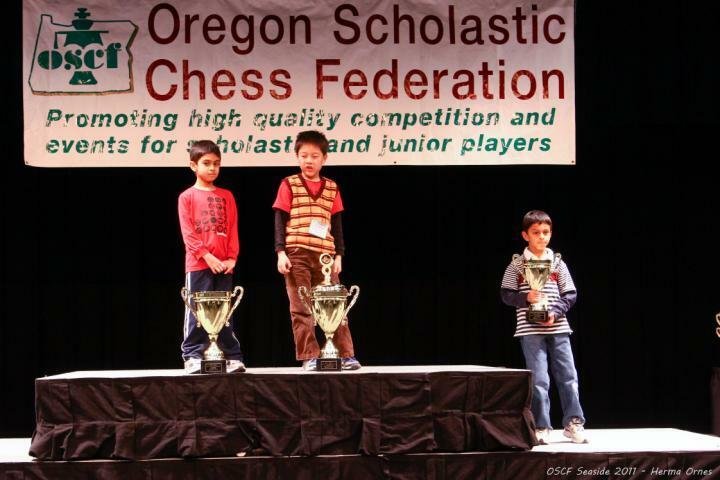 The 2011 OSCF State Chess Championships were the biggest yet. Total participation was 268, exceeding last year’s record 251 by a healthy margin. The high school division (38) grew by 58% over last year’s (24), and the middle school division (88) grew by 21% over last year’s (73), while turnout for the elementary school and primary school divisions was slightly below last year’s record numbers. All the results are rated and posted at NWSRS. Below are some of the highlights from the Elite sections for each age division. Another player who just doesn’t seem to understand that lower-rated players are supposed to lose against their higher-rated opponents is Collin Goldman. Up against the top three players in the section — all of whom were at least 200 points higher rated than him — Collin scored 2.5/3 for a shot at first place. But he fell to Alex Piatski in the final round and had to settle for third, while Alex ended up in second. Last year, Erik Skalnes (1689) finished in fifth place, despite being among the favorites to win. With another year of experience under his belt and several of his closest rivals moving into the HS division, Erik Skalnes (1689) figured to have a much easier march to the top of the cross tables this year at Seaside. However, in the summer of 2010, David Wen (1764) moved to Oregon from Ohio and instantly became the highest-rated middle school player in the state. At this year’s State Championship, both David and Erik were over 100 points higher rated than anyone else in the section and heavy favorites to finish on top of the heap. Although Erik has somewhat of a bad habit of under-performing in the first round of big tournaments, he cruised through his first two rounds at Seaside to set up a much anticipated third round battle with David, who also won his first two games. The game turned out to be somewhat of an anticlimax, though, with quick liquidation of the pieces resulting in a lifeless, even position. The players agreed to a draw. Both won their final games to finish tied at 3.4/4 and shared 1st place. Close behind the leaders was Clemen Deng at 3/4. Clemen took the state by storm last season, picking up over 200 rating points. He continued his hot streak through the first round at Seaside but fell to Ben Pikus in the second round. He won the last two rounds, which wasn’t enough to catch the leaders but did pick up a nice third place cup. Coming into this year’s State Championships, Max Sun was the prohibitive favorite — nearly 250 points higher rated than his closest competitor and well over 300 points higher rated than nearly everyone else. Max had won all four championships he’d participated in and hadn’t lost a single game in the event since 2007. In the first round, though, Leo Deng scored a stunning upset over Max. Leo held on for dear life in drawing the next two rounds and winning his final game, while Max won his remaining games to tie him at 3/4 and once again take home a championship cup. Next year they both move up to the much tougher Middle School division along with Torrey Gage-Tomlinson and Josiah Perkins, who rounded out the top four in the section. Four players tied for 5th-8th: Leonardo Sun (wins 5th on tiebreaks), Liam Booth, Andrea Botez, and Seth Talyansky. All four of these players will be back in the Elementary Division next year. The Primary School Elite section was a six-player round-robin among the six highest-rated players in grades K-2. Last year’s co-champions Colin Liu and Praveer Sharan each finished at 4/5 again this year and again shared the title. Next year, though, Colin is moving up to the Elementary School division, leaving his rival and friend in the Primary School division to fend for himself against up-and-coming players like Ankur Moolky (3.5/4), Pike Jordan, Kyle Liu from this year’s elite section, and a host of players from the other primary school sections. Fourth place finisher Jolan Hutchinson (2/5) will be joining Colin next year in the elementary division.